Import Payment through Online Payment Gateway Service Providers? As you know any amount receivable to India against exports and any amount payable by India on account of Imports is regulated by Reserve Bank of India, RBI who acts as banker’s bank in India. So you are liable to answer to RBI for any foreign inward remittance and foreign outward remittance. Telecommunication and digital world changed world a lot in turn Indian imports and exports widely for the past few years. The Online Payment Gateway Service Providers also plays a major role in acting as a middle man to transfer money digitally inside country and foreign. 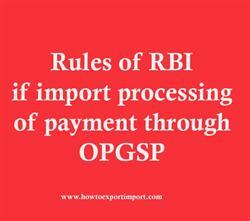 What are the latest rules of RBI if import processing of payment through OPGSP (Online Payment Gateway Service Providers)? (ii) charge back from the overseas exporters. (iii) payment of commission at rates/frequencies as defined under the contract to the current account of the OPGSP; and (iv) bank charges. The above post explains about latest rules and regulations of RBI if import processing of payment through OPGSP (Online Payment Gateway Service Providers) in inward remittance from foreign country.